Frontier Restaurant is one of the most popular hangouts for nearly everyone. Plenty of people dine at the Frontier because their food is great and quickly made to order. A lot of college students frequent the establishment, and sometimes come back again the same day. 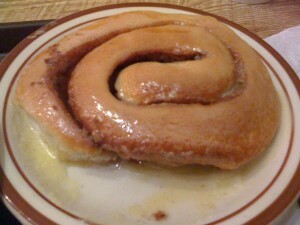 On this trip to Frontier, I had two of their popular items: a breakfast burrito and sweet roll. These delectable menu items are what make the Frontier a great place for anyone needing a quick bite. 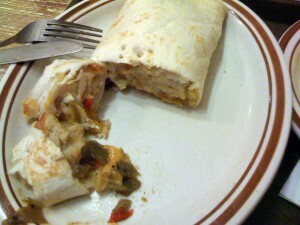 The breakfast burrito is made with a tortilla, one that is made in the restaurant on their tortilla-making device which you can see from the dining area. It is filled egg, cheese, hash brown, and green chile. This burrito is very simple and affordable. The fact that their tortillas are made in the restaurant means that they strive to serve their food as fresh as possible. What I had next is another favorite menu item. Sweet rolls are ordered on their own and it’s just what you get. A honeycomb-like roll with a buttery sugar glazing. They prepare these rolls ahead of time, spread the butter and sugar on top, and refrigerate. When one is ordered, it goes into the microwave where the roll is heated up and melts the butter to make it a very delicious dessert. It is important to eat this roll when it is warm, because it is soft and gooey. The intended audiences for these two menu items are those who want to get a quick bite, dine with friends, or just love great food.